Art, fashion and music will join forces onstage at Kellogg Community College this month in a multimedia Guest Artist Recital presentation headlined by alumna Abigail Mullis. Mullis, a pianist, will return to campus as the featured performer in “Reviving a Tradition of the Past: An Interdisciplinary Piano Recital.” The event begins at 7:30 p.m. Friday, April 12, in the auditorium of the Davidson Visual and Performing Arts Center, on campus at 450 North Ave. in Battle Creek. A 2016 graduate of St. Philip Catholic Central High School, Mullis dual enrolled at KCC, studying voice under KCC vocal instructor Betty Picard. 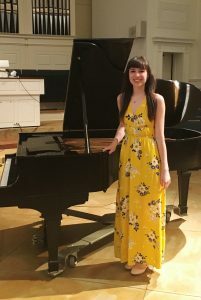 Now a junior at Central Michigan University, Mullis is a music major studying piano under Dr. Alexandra Mascolo-David. In addition to a program featuring a number of classical piano compositions – including works by Bartok, Beethoven, Brahms, Chopin and Soler – Mullis’ performance will incorporate works from visual artist Colleen Friar and fashion designer Joseph Lin created specifically to accompany the piano program. Lin, also a KCC alum, studies menswear at the Fashion Institute of Technology in New York City and designed the dress Mullis will wear during her performance. Friar, an art student at Western Michigan University, created a painting that will be located onstage. In her project summary, Mullis says the interdisciplinary nature of the event explores themes including artistic collaboration and the creation of classical music experiences for contemporary audiences. For more information, contact Dr. Gerald Case-Blanchard, professor of vocal music and music area coordinator at KCC, at blanchardg@kellogg.edu. Mullis is a recipient of CMU’s 2018 Provost’s Award for Undergraduate Research and Creative Accomplishments and was the 2017 winner of the university’s John Irwin Memorial Piano Competition. Her research focus is on STEAM education – science, technology, engineering, art and mathematics – and developing ways to incorporate the arts into the core of education. 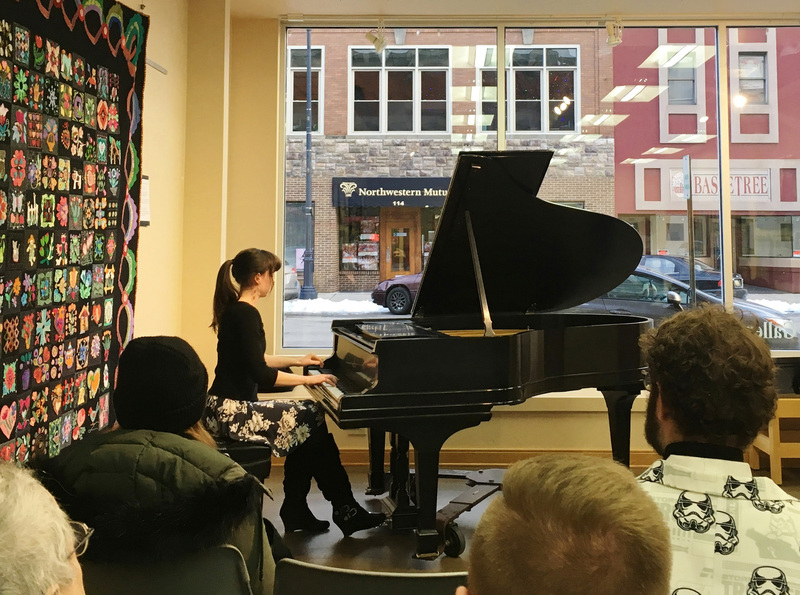 Her “Reviving a Tradition of the Past” project is funded through an Undergraduate Research and Creative Endeavors Grant from CMU and includes solo piano performances in Michigan and Paraguay. Lin graduated from St. Philip Catholic Central High School in 2014. He studied at KCC from in 2014 to 2016 and at the Academy of Art University in San Francisco in 2016 and 2017. Currently, Lin is in his second year of study at the Fashion Institute of Technology in New York City, majoring in menswear design. His work has been exhibited at shows and universities, and his capstone collection will be released in the fall of 2019; his current spring/summer collection will be displayed in June 2020. Friar graduated from Forest Hills Central High School in 2016 and is currently majoring in fine arts at WMU with a minor in event management. Friar’s art has been exhibited throughout the greater Kalamazoo area, including in the Union Cabaret’s student art show in 2018 and in the Annual Student Printmedia Exhibition at WMU’s DeVries Student Gallery. As part of the “Reviving a Tradition of the Past” project, Friar’s art will be displayed in multiple venues throughout Michigan and Paraguay.